Soap & Glory A Great Kisser Juicy Peach lip balm Review. I bought this lip balm from Boots at Heathrow airport in London. 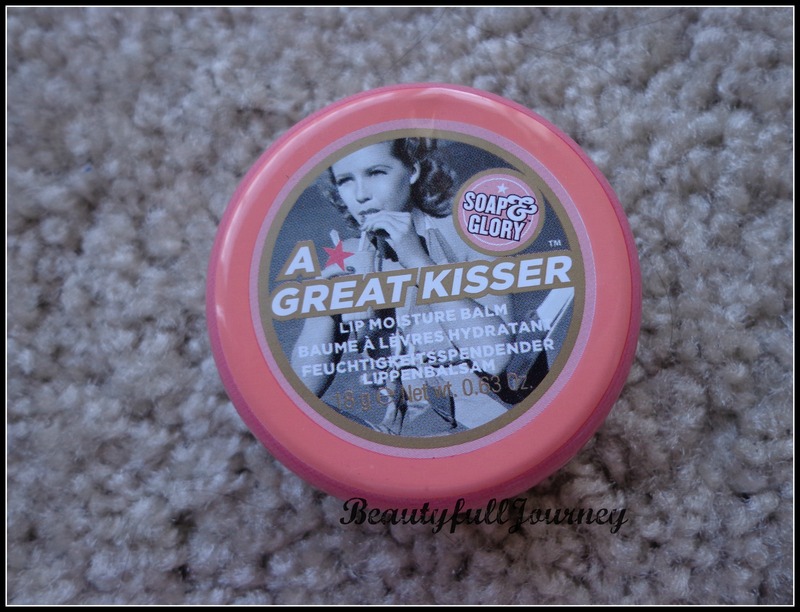 My first tryst with Soap & Glory products when Sephora first opened in Delhi and I bought their Soaper Heroes kit (click on title for review). I’ve been in love with S&G products since then and always eager to try out new stuff from this brand! So, when I spotted this lip balm at Boots at the airport it looked very tempting and I bought it 🙂 and I’ve been completely in love with ever since! I even featured it in my Friday Favorites post twice! Many times, such tin lip balms are difficult to open but surprisingly this one opens very easily and also keeps shut properly. It’s very convenient to use and the tin is very lightweight and easy to carry. This lip balm comes in 5 flavors according to their website – Peppermint, Sweet coconut, Juicy Peach, Chocolate Cherry and Vanilla Bean. The scent is not a very strong fragrance but something that is very prominent. And the scent is also not the artificial kinds, it smells very natural and very good! It’s texture is so so soft. It doesn’t come on your finger instantly. But just one-two times you circle your finger in it and you get a soft gooey lip balm on your fingers with no effort. 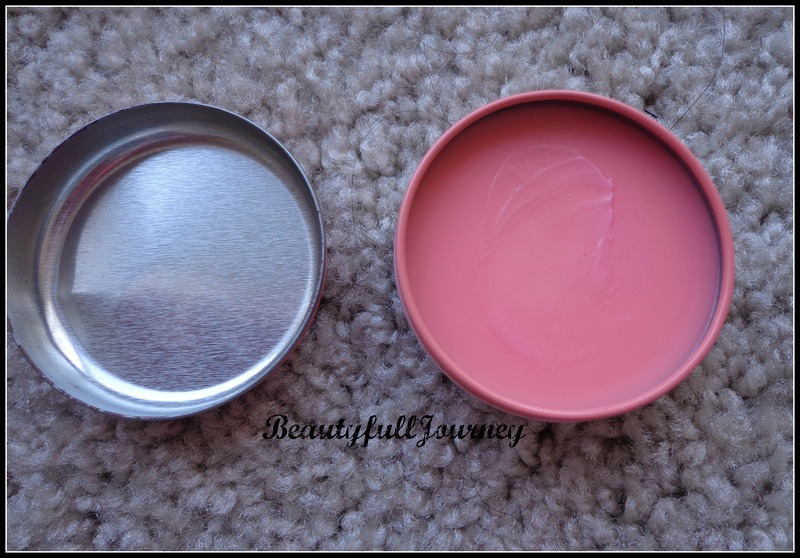 It really has a beautiful texture that just melts at one touch of your fingers and it gets applied on the lips very smoothly. 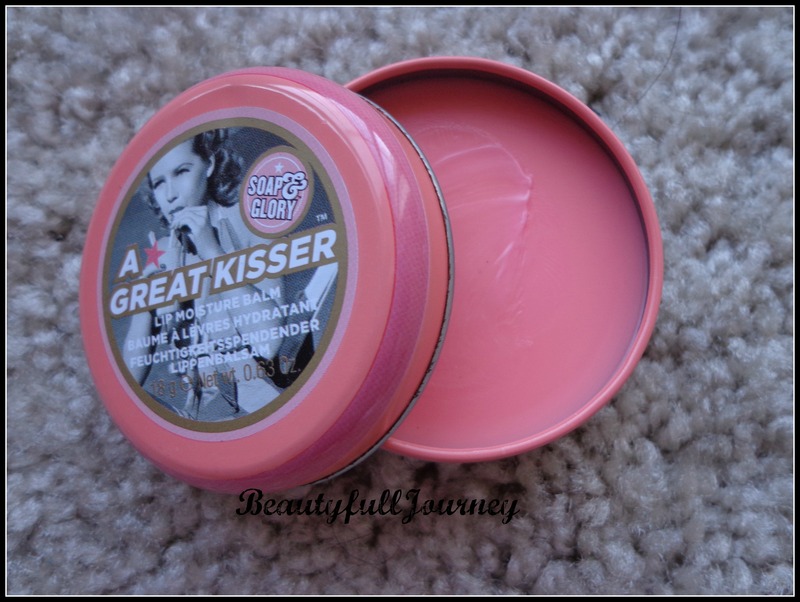 Soap & Glory defines the lip balm as – this melt-on-your-mouth conditioning mix may just be the best lip balm ever made. A great kisser™ is formulated with mango butter to moisturize, apricot butter for weather protection, lingonberry oil to boost barrier repair (and prevent water loss) and pomegranate extract to renew your ‘dewy’. It’s not too waxy, not too slippery, not too greasy or too sticky. In fact, it’s just fabulous. On lips, it gives a kindof glossy look and gives a very healthy look to lips with a slight tint of color. The tint is very naturally peach and blends in so well with lips that it just gives a healthy glossy shine to lips and nothing more! I couldn’t get a swatch picture as the balm just kept coming as clear and transparent on my fingers! It also lasts a pretty good time on your lips, that is if you don’t lick the balm! I’m in absolute love with this lip balm and I just can’t get over it 😛 these days I use it allll the time 😀 the texture and fragrance combined make it such a pleasure to use! But also, I want to point out that the quantity of this balm is 18grams which is quite huge! And you need a tiny amount to cover your lips at a time so thinking rationally, it might not be all that expensive! 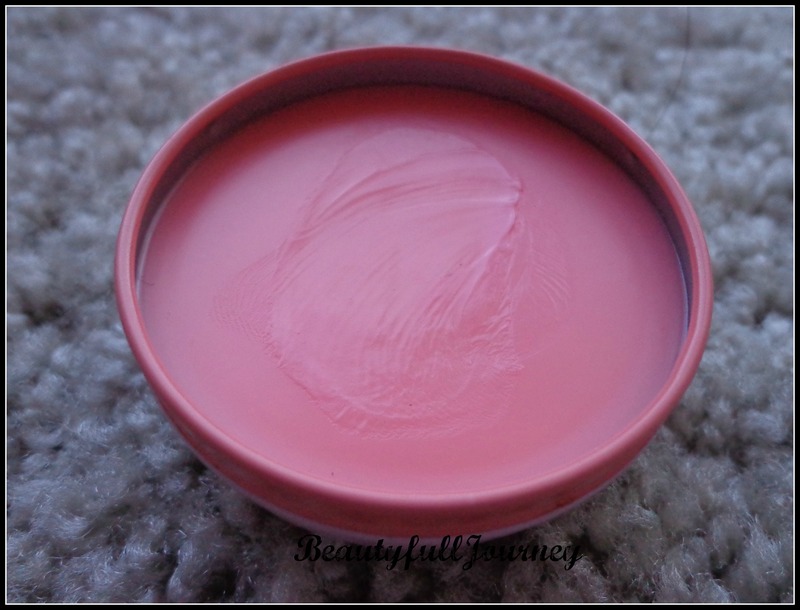 I personally felt the quantity of the balm, the feeling of the brilliant texture which is such a delight to use plus the fragrance and how it softens my lips, this all is worth the price and I do not regret spending this amount on it at all! Ingredients: Polybutene, Octyldodecanol, Cera Microcristallina (Microcrystalline Wax/ Cire Microcristalline), Paraffinum Liquidum (Mineral Oil/ Huile Minérale), Bis-Diglyceryl Polyacyladipate-2, Silica Dimethyl Silylate, Synthetic Wax, Lauryl PCA, Paraffin, Mangifera Indica (Mango) Seed Extract, Prunus Armeniaca (Apricot) Kernel Oil, Parfum (Fragrance), Vaccinium Vitis-Idaea Seed Oil, Isopropyl Myristate, Tocopherol Acetate, Saccharin, Butyrospermum Parkii (Shea Butter), Hydrogenated Vegetable Oil, Pentaerythrityl Tetra-Di-T-Butyl Hydroxyhydrocinnamate, Tocopherol, BHT, Caprylic/Capric Triglyceride, Rosmarinus Officinalis (Rosemary) Leaf Extract, CI 15850 (Red 6), CI 15985 (FD&C Yellow 6 Al Lake), CI 77891 (Titanium Dioxide). 1) Attractive & Convenient packaging. 4) Very soft and wonderful texture. 5) Huge quantity in tin. Will last long. 6) Gives a very pretty glossy look. 1) Not enough for very dry lips. 2) Tin packaging can get unhygienic. Next > Lotus Herbals Hypnotica Liquid Eyeliner New Launch! Looks so cute! I’ve recently been hoarding lip balms as well (: sad but I dont think its available here yet!